If you’re looking to roam highways and byways in laid back, cool comfort while also keeping the price of ownership on the level, here is a list of can’t miss bikes and tips just for you. Pick a bike that allows you to reach the ground flat footed. With cruisers this is rarely an issue because they often have seat heights well under 30 inches. Comfort in general actually should be priority one or two when choosing any kind of bike because it will put you at ease which helps riding skill develop faster. Look to keep the engine size in the 250 to 800 cc size. If you’re above average size you can go to the higher end of the spectrum (here are some good options for heavier riders). Don’t worry about outgrowing the bike; This likely won’t be the last one you buy, and a quality learning bike is easy to resell when you’re ready to move up. Regardless of your size, none of these bikes will be found lacking in the torque department, so they can shoot off the line fast when asked to and aren’t boring to ride. Brand new is hard not to like, but on the other hand why spend more than you have to? 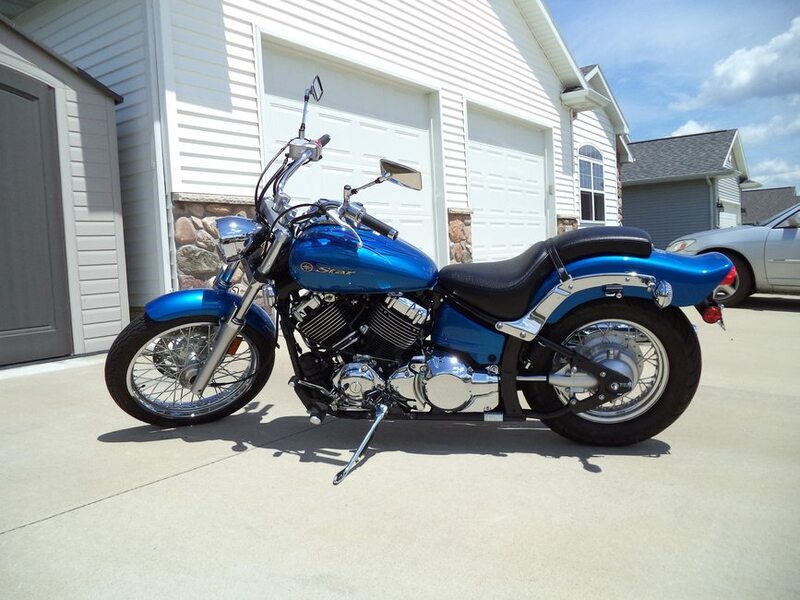 I think you’ll find $5000 to be a fairly big chunk of change on the used market and can easily purchase a great bike with some patient searching. Many owners take good care of their bikes and wisely keep up with the maintenance. Those are the bikes you’re after and they can usually be purchased for $4000 (or even half that in earlier model years). One more thing. It’s a good bet that your first bike is going to fall over at some point. Even seemingly harmless, low speed tip-overs leave scars. It’s not nearly as painful to add another scratch to a “previously loved” paint job rather than putting in the first one yourself. If you are a petite or shorter new rider, you may find most motorcycles too tall and/or heavy for you to confidently ride. For those people, or ones of average size who just want a zippy and ultra lightweight machine for two wheeled fun, Honda offers the Grom. Boasting modern styling (it certainly doesn’t look like a beginner motorcycle), and looking a bit like it was left in the dryer on high heat too long (since it’s about half the size of most motorcycles), the Grom has unusual “impish” charm. With a price tag brand new of about $3300 USD, you can find them used for much less than $5000 despite the fact they’ve only been around since 2014. These very capable bikes have some nice features found on much larger and more expensive ones, such as fuel injection, LED lights, inverted front forks, and a monoshock rear. The Grom’s popularity has grown to near cult classic status, being that they are so easy for anyone to ride confidently. You can even carry a passenger. Is the Grom really a cruiser? It’s debatable, but I’m including it as one because I don’t know where else to mention it. One determined owner rode his Grom from Portland, Oregon over 3000 miles to Alaska. Using that criteria, it could be considered a touring bike! 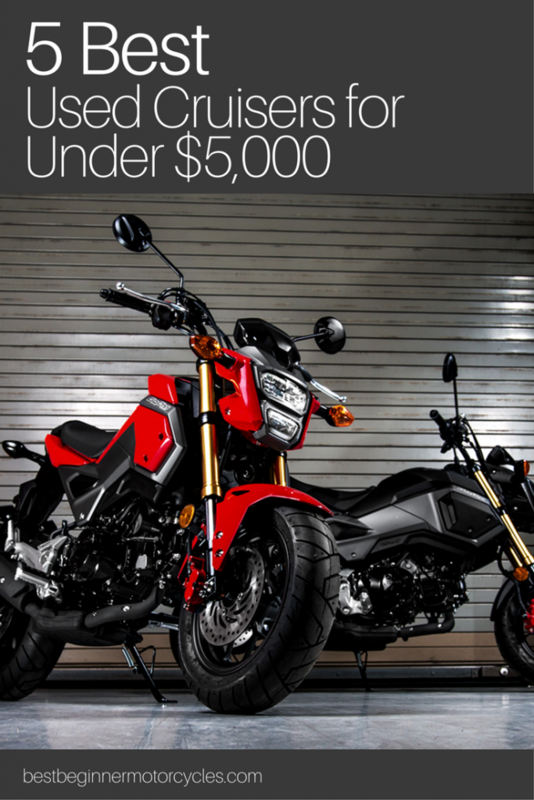 It seems the Grom can be what you decide to make it… as long as you don’t plan on going faster than its top speed of 62 mph that is. Fuel economy of 134 mpg! The Rebel has been a huge favourite among new bikers since it launched in 1985. 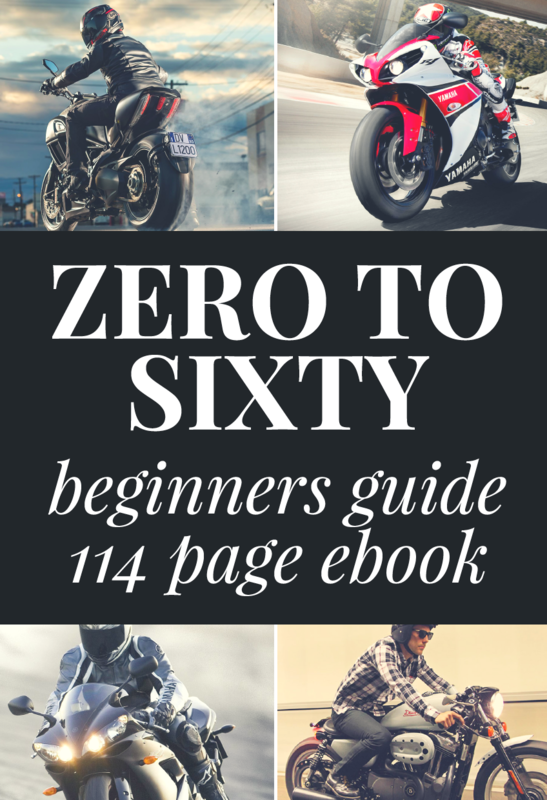 You’ll often find these bikes in the fleet of motorcycle training schools because of their beginner-friendly torque and horsepower levels (coupled with excellent reliability). While not quite as small or maneuverable as the Grom, the CMX250 Rebel is still very light (at 320 lbs fully fueled) and has nearly twice the engine to complement its classic cruiser styling. You won’t get the fuel economy of the Grom, but the Rebel’s 62 mpg is respectable. The 250 can easily be purchased used for prices ranging from about $1200 for older Rebels, up to $3000 for later model versions. Terrific value for the price! 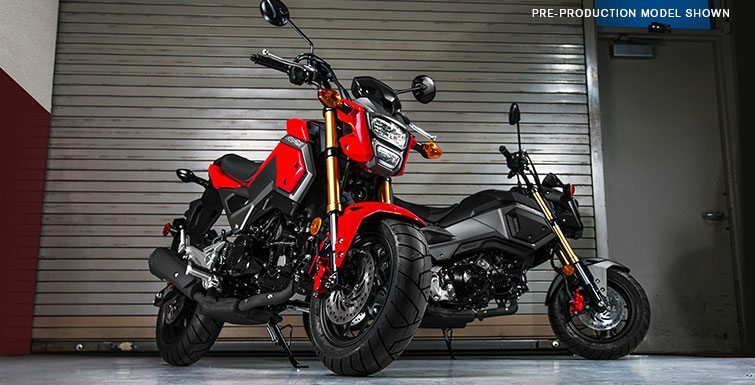 If the Grom is too compact and futuristic for your palate, definitely cast your glance the Rebel’s way. See our in-depth review of the Rebel 250. 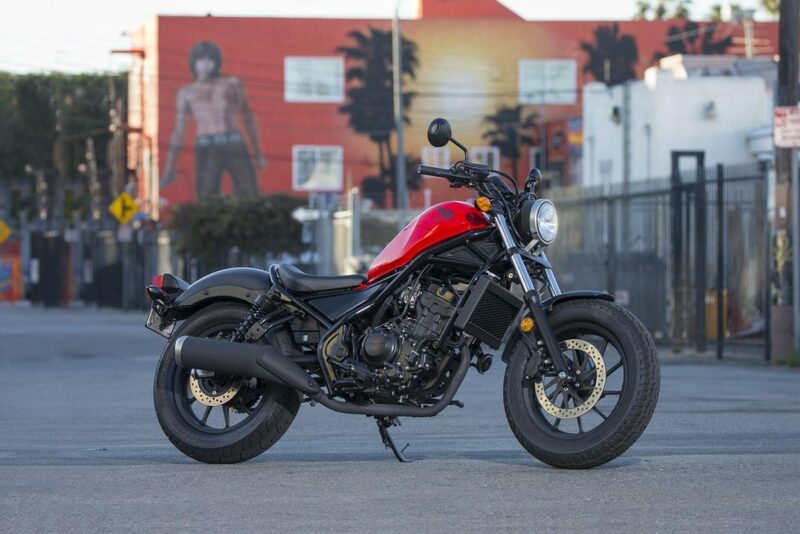 In 2017 Honda replaced the 250 Rebel with a totally redesigned CMX300 Rebel. They really did a great job updating the bike and sales have reflected that. So much so, in fact, that it’s very hard to find them at the dealership to just look at. The new 300 Rebel brand new is priced at $4700 USD- just below our $5000 budget. They’re very rare on the used market at this point (being so new), but if you watch carefully you might see one at the top of your budget available. The new 300 Rebel is a whole different animal than the 250 and easily worth the extra money if you have it in your budget. Here’s another motorcycle that has been around forever. Originally dubbed the Suzuki Savage when it came on the scene in 1986, the LS650 is a terrific mix of low weight and useable power. The 652cc air cooled single cylinder engine is noticeably gutsy without being overwhelming. The bike is still compact and low to the ground, but gives some increased power for more confident learners to work with. It has no issue keeping up with traffic on the highway (unlike the smaller displacement bikes I’ve mentioned so far). In fact, the Savage is actually surprisingly quick when asked to get up and go, while offering very good maneuverability by cruiser standards. 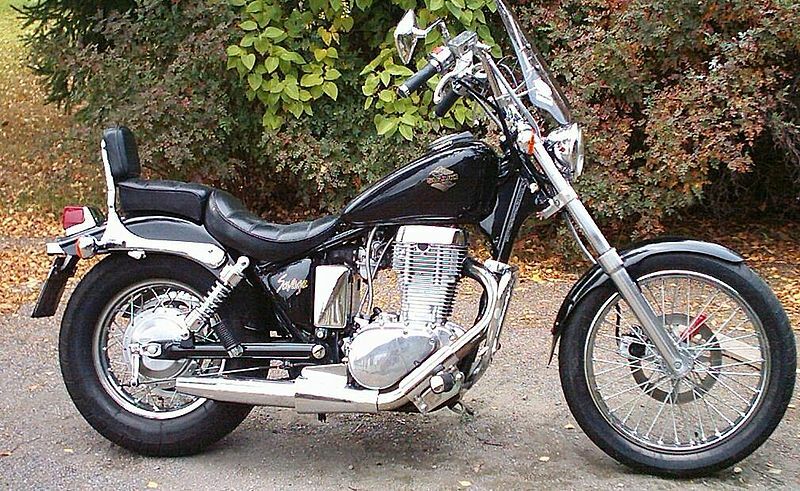 In 2005 the Savage became the S40 in name (mostly), but was given some very minor cosmetic updating changes along with straighter, drag-style handlebars. Before that, the only real changes came in 1993 when the transmission went from 4 to 5 speeds. That gives you an idea just how good the design is: simple, reliable, and straightforward. 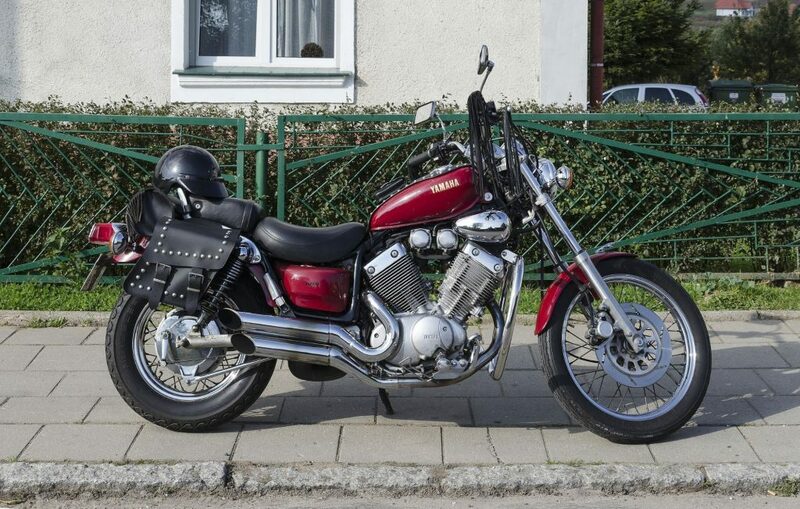 The Suzuki Savage or S40 is a bargain on the used market. Prices are very comparable to the 250 Rebel ($1200 to $2500), but you get a lot more performance for your money. Worthy of note is the low maintenance belt drive on the Savage/S40. No lube or cleaning to muss about. Check out our article comparing the S40 to the S50. Yamaha’s Virago series of bikes were all real winners over many years, and the 535 is a near perfect beginner bike of that pedigree. This – like the others mentioned – is a smaller sized, lightweight, and nimble cruiser that is well-known as an excellent beginner bike. 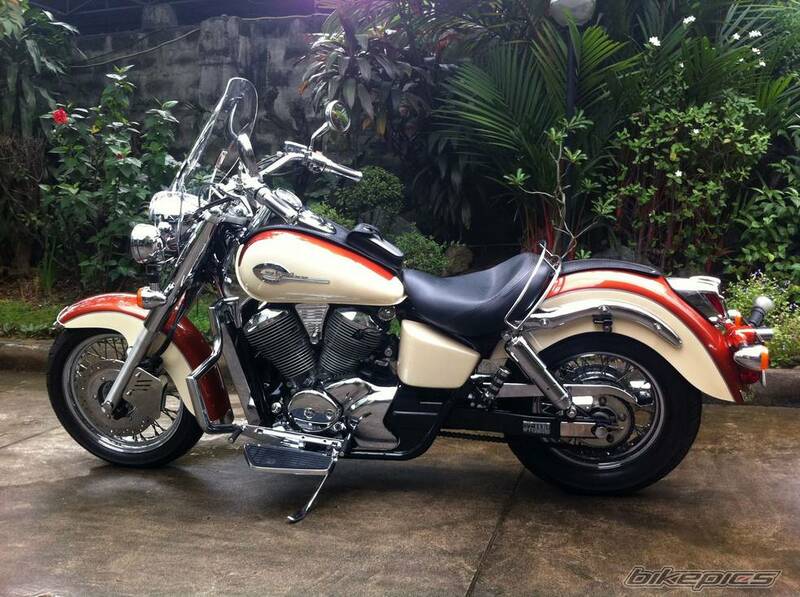 Amongst the bikes I’ve recommended so far, I like this 535 Virago the most because of its “non-beginner” cruiser look. When you look at the twin, slash-cut exhaust system and copious amounts of chrome, it serves notice to onlookers that this machine needs to be taken seriously. Another great and rare feature of the 535 Virago is the shaft drive on it. I can’t stress how nice it is to have a low maintenance feature like this on your first bike. Most of all I like the V-Twin air-cooled engine. To me, a stylin’ cruiser and a V-engine truly belong together. The V gives this little bike some real personality in its sound and torque. Put some aftermarket exhaust on a Virago and it sounds MEAN. That’ sound is priceless, and happily this bike can be had on the used market to fit any budget because it was produced from 1987 all the way until 2003. In 2004 the Virago line didn’t disappear, it got upgraded. 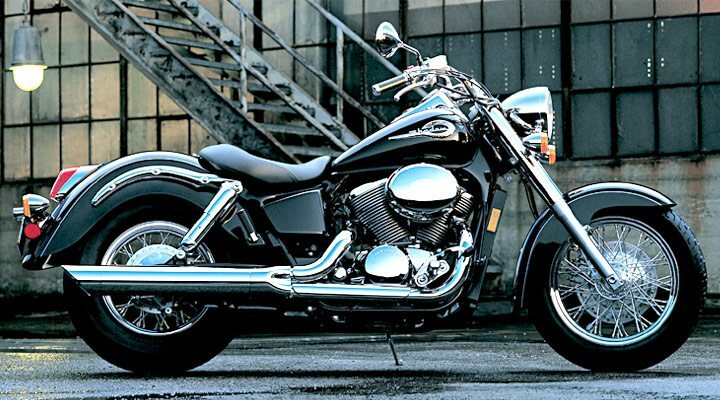 Yamaha knew it had a quality bike high in demand, and so it kept all the good features of the 535 but bored out the engine to 649cc to build an even better looking and performing bike in the V-Star XVS650. More displacement gives the V-Star higher torque (at 37.5 ft) lbs while maintaining basically the same 42 horsepower the 535 had. Using the same frame from the 535, Yamaha added a much larger fuel tank to the V-Star (to increase range), along with larger fenders, side panels, tires and a better seat. As a result, the V-Star is a fair bit heavier (at 514 lbs) and the power to weight ratio drops to 0.081. These changes make the V-Star more stable at higher speeds while still retaining a beginner-friendly amount of linear power- needed to build confidence and riding skills. The V-Star is readily available on the market in both a Classic and Custom trim to suit different tastes, and easily comes in below our $5000 budget. My final pick is another Honda (I’m not on their payroll, I swear! ), but it’s impossible to overlook the fact Honda has built many bikes – that stand the test of time – that are well suited for learning to ride on. 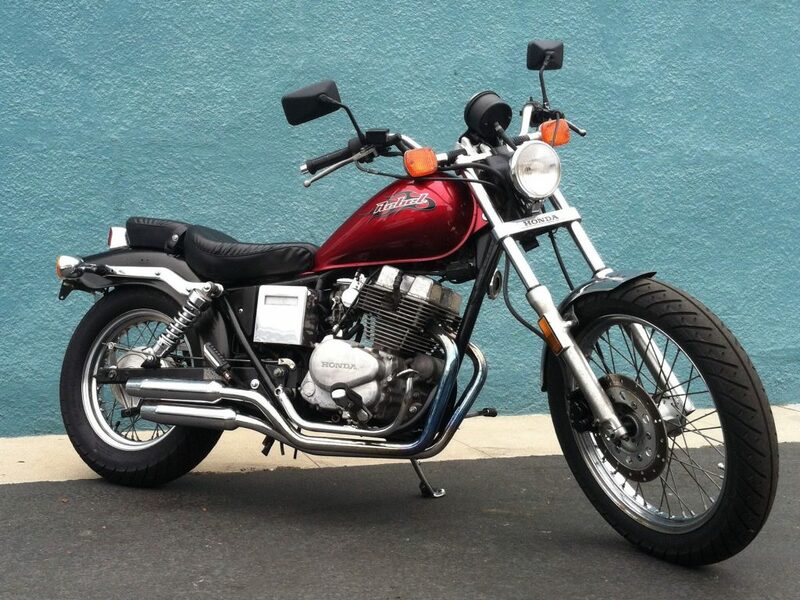 If you’re a taller and/or heavier learner looking for a cruiser that won’t break the bank, this Honda is it. It offers a stretched out riding position, with the most legroom out of all the bikes I’ve offered up so far. The Shadow Ace is, without question, a full-sized motorcycle (and looks it too). Happily, the weight is carried down low in the frame, so it doesn’t feel heavy to hold upright even at 504 lbs dry. The power and handling are good and true to Honda standards: very smooth. 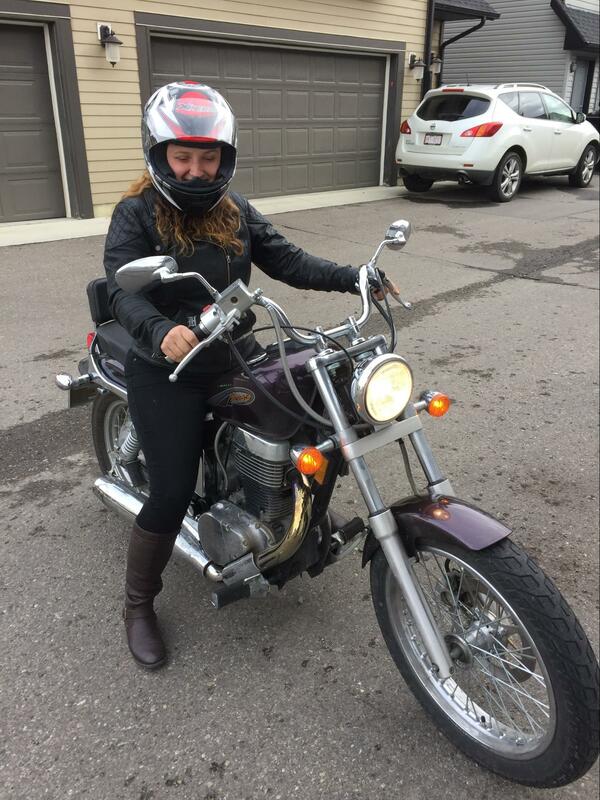 Its V-Twin engine offers a lovely growl and purr that one expects of a cruiser with classic styling. It sounds even better with a set of Vance and Hines slip on exhaust. Many owners tend to remove the heavy stock exhaust in favour of a lighter aftermarket system- not just for the sound, but to further improve the Ace’s handling and performance by shedding unnecessary weight. Tons of aftermarket mods are available for the Ace, and so you can dress it up for whatever purpose you have in mind- be it touring long distance or just ripping around town. The Shadow line of Honda bikes has been around seemingly forever (since 1983 actually) and is available in a broad range of engine sizes. The 750 Ace specifically was built from 1998 to 2003, and you’ll easily buy any of them from those years under our proposed $5000 budget. The longevity of these bikes is almost unbelievable due to the fact Honda overbuilt them for the power level they put out. A friend of mine recently bought one for about $800 with well over 65,000 miles on it. I was even more impressed with the price paid after I saw and heard the bike running in person. It ran perfectly. No valvetrain noise, knock, and it burned no oil. The bike didn’t want for anything and my friend is still riding it a year later without having made any modifications or repairs. Phenomenal quality of build is apparent with these Aces… the name is completely appropriate. You really can’t go wrong getting into one of these bikes or any of the others I’ve mentioned.